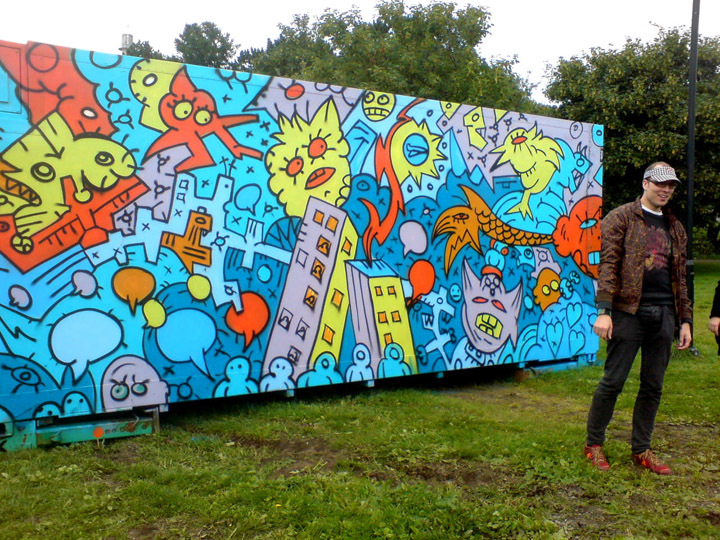 2007: I was invited to do a work on a container for the Park Art festival. So I made it colorful, expressive, and fun on the outside. Then I remembered the drunks and junkies spraypainting obscene words and simple drawings inside broken containers on the ports in my home town as I grew up. I thought it was a good idea to do that to the inside as a contrast to my efforts. I wanted to hightlight how important creativity is as a way out of selfdestructive patterns. Just doing it and doing it untill the patterns break. I myself, for sure, would have had nothing in my life it wasn't for the joy of creating and thinking. The container is still roaming around somewhere in the northern parts of Norway. Unfortunately I forgot to document the inside.